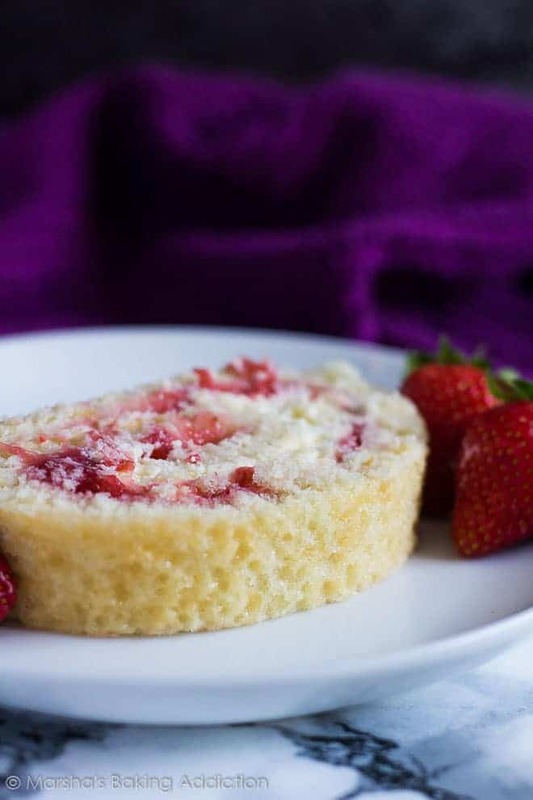 Strawberries and Cream Swiss Roll – Deliciously moist and fluffy vanilla cake filled with a layer of fresh strawberry sauce, and a layer of homemade whipped cream. The perfect summer dessert! 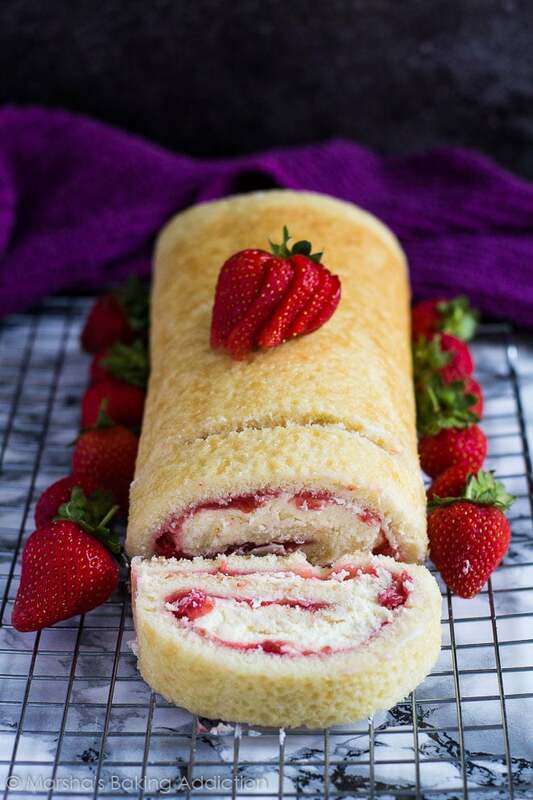 How about a slice of my Strawberries and Cream Swiss Roll to cure your summer desserts craving? How about two slices?? You’re gonna want two, this cake is so much better than store-bought. I promise. 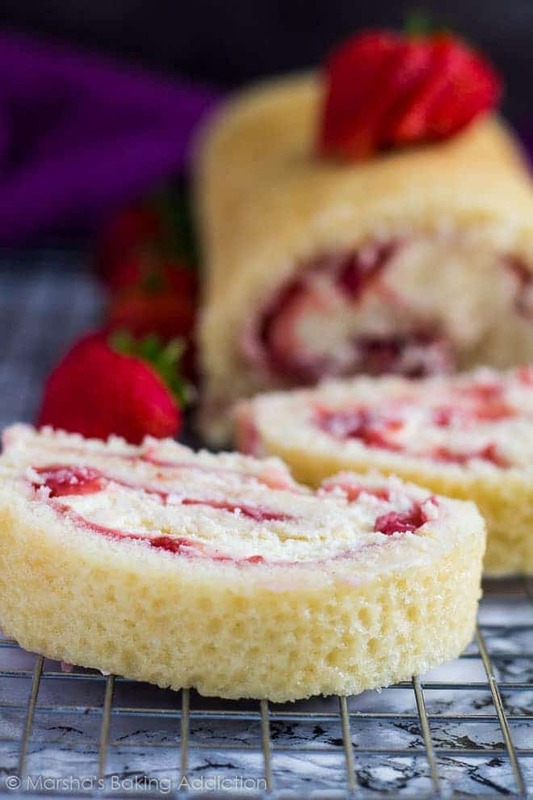 This is one of my favourite Swiss Roll recipes (and I love making swiss rolls!) and I’m excited to share it with you! This cake is so moist and fluffy, and infused with vanilla. Filled with fresh strawberry sauce and homemade whipped cream, it really is one of the best desserts you’ll ever make this summer, and it’s a real crowd-pleaser. Best make two just to be safe, because they’re gonna ask for seconds! Try these cake rolls next! 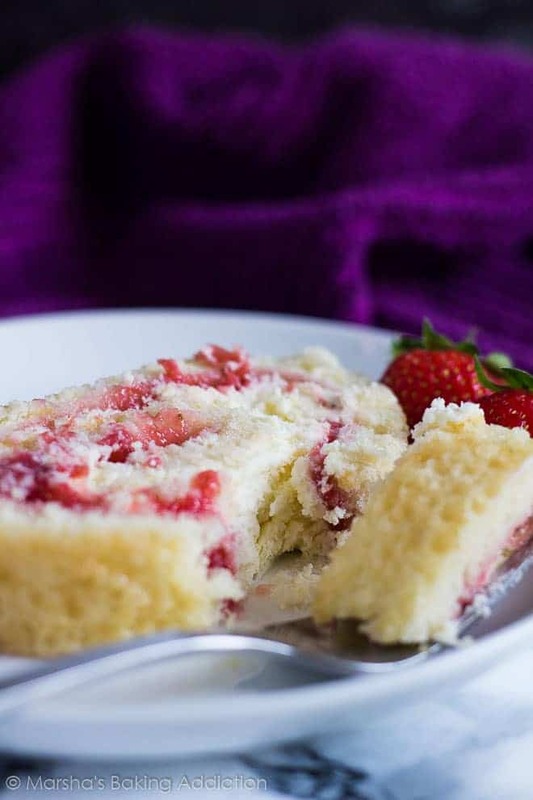 Deliciously moist and fluffy vanilla cake filled with a layer of fresh strawberry sauce, and a layer of homemade whipped cream. The perfect summer dessert! Using a food processor, blend the strawberries and water until smooth. If you want a chunky sauce, simply slice the strawberries into smaller pieces and move on to step 2. In a saucepan over medium heat, add the strawberry puree (or pieces), sugar and cornflour, and stir constantly until the mixture thickens and comes to a boil. Allow to boil for 1 minute, stirring constantly, then remove from the heat. Transfer to a small bowl and allow to cool completely. Using a handheld or stand mixer, beat the egg yolks on high speed until thick and frothy. Gradually beat in the sugar, vanilla, and yogurt. Add the flour and baking powder, and mix well. In a separate bowl, beat the egg whites and salt until stiff peaks form. Gently fold into the batter. Pour the batter into the prepared pan, and spread out evenly. Bake for 8 - 10 minutes or until the cake pulls away from the sides, and a toothpick inserted in the centre comes out clean. Allow to cool in the pan for 5 minutes. Invert the cake onto a tea towel dusted with a generous amount of icing/powdered sugar. Gently peel off the parchment paper, dust the cake with more icing sugar, then roll up the cake with the tea towel, starting at a short end. Allow to cool completely on a wire rack. Using a handheld or stand mixer, whip the heavy cream until it starts to thicken. Add the icing sugar and vanilla and whip to stiff peaks. Re-roll without the tea towel. Cover and chill for at least 1 hour. Dust with icing/powdered sugar, or garnish with strawberries, then slice and serve. This looks scrumptious…strawberry desserts are always just the best! Great tip on making your own cake flour too! This is such a beautiful dessert! I love how light it is – perfect for a shower or brunch even. Can’t wait to give this recipe a try! Wow!! How beautiful is this roll? 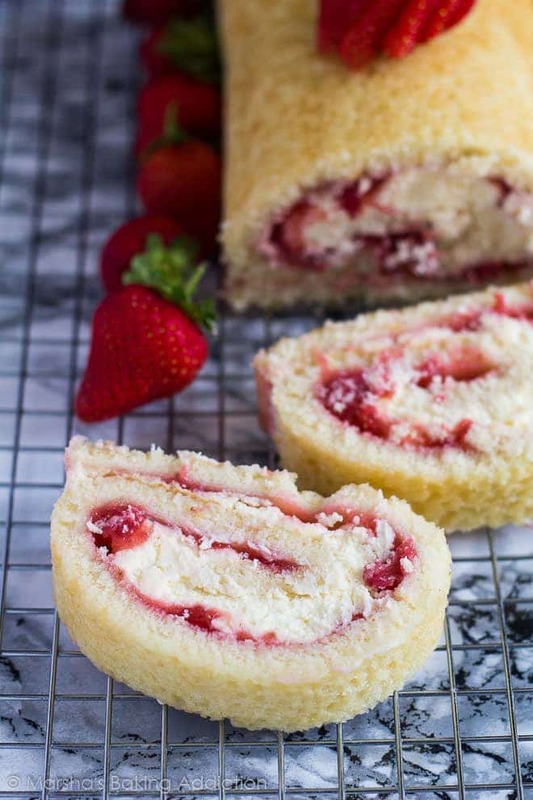 I’ve never attempted to make a dessert roll but from the looks of this one I am going to try! It’s so beautiful! And no…not missing the summer because I’m in AZ and it’s about 100 degrees F until about Nov 1 – so this is perfect to make almost all year round! Thanks for the recipe!! I love summer when it comes to summer drinks and those summery food, but when it comes to the weather , I love autumn season very much. this is a real show-stopper, marsha! beautiful and tasty, it’s a combination of ingredients that is very hard to beat! Vanilla cake is my all time favorite, probably because I’m allergic to cocoa, but I mean you just CAN’T go wrong with a classic. But you CAN make it even better – by turning it into THIS! This swiss roll is gorgeous, Marsha! LOOOVE the strawberries! Cheers! 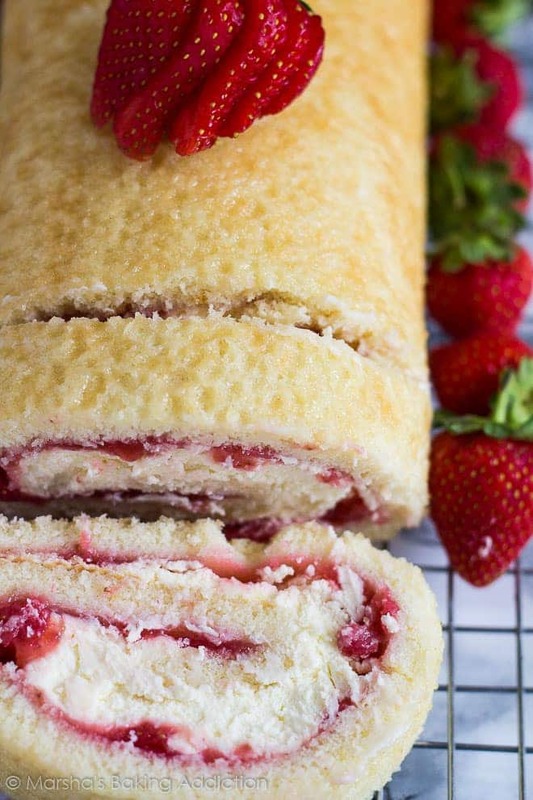 Your swiss rolls are always gorgeous and this one is no different! I love that strawberry in it- yum! 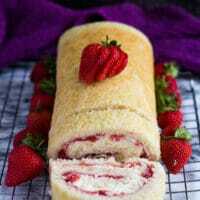 This Swiss roll is so beautiful and elegant! I know a strawberry lover who would go nuts for this! Really pretty. I made this for Easter. It was delicious with the bits of strawberry in the sweet whipped cream. My husband does not care for whipped cream in general but raved, even had a second slice. And the thing is, it wasn’t hard. I fretted about the turning out and rolling but it worked beautifully as you instructed. I stood in the kitchen calling out, “I did it!” several times upon completion. Great recipe!